Diabetes is a condition in which a person can have a high level of blood glucose (sugar) which if not brought under control can negatively impact quality of life. Think of high blood glucose levels like really sticky sugary blood. This stickiness means that your blood can get stuck when it gets to small vessels (like those in your feet and eyes). When blood gets stuck it clots and the part of the body that was supposed to get this blood can be damaged. When this sticky blood gets trapped in larger vessels you are at risk of heart attacks (where parts of your heart do not get enough blood), strokes (where parts of your brain do not get enough blood) and heart failure (where your heart does not pump blood out very well). Risk is higher when combined with high Cholesterol (think of lumps of butter or lard blocking your blood vessels along with sticky blood) and high blood pressure. A large number of people in the United Kingdom have diabetes (recent estimates are over 2.3 million) this number is growing rapidly and nearly half a million people have diabetes and do not even know it. If diabetes isn’t treated, it can cause long-term health problems because the high glucose levels in the blood can damage other parts of your body. If you’ve been recently diagnosed, find out about what treatment options are available. The good news is that it can be managed easily by making simples changes to healthy eating and lifestyle. Diabetes can be managed effectively and many people with diabetes lead healthy and active lives. TYPE 1- This is where a person’s body produces cells that damage the pancreas (the organ that produces insulin to reduce sugar in the blood) and so cannot manage their own blood sugar. Type 1 diabetes most commonly occurs at a younger age. 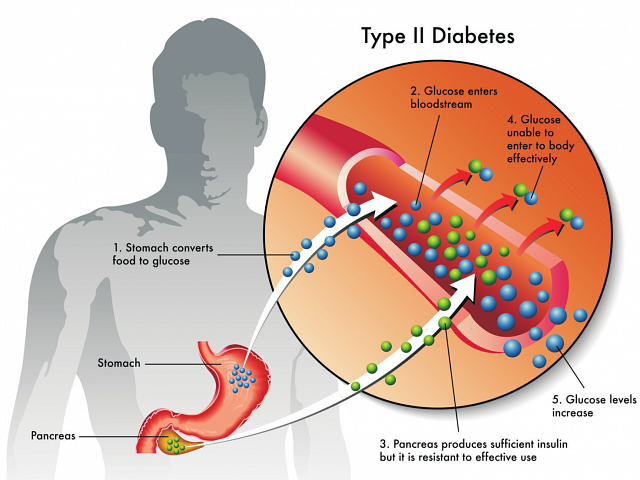 TYPE 2- This is where a person’s body becomes resistant to insulin. This is usually linked to increased weight (or waist circumference) and low levels of exercise. If you smoke or use tobacco, STOP! Local services can help you as the health benefits start immediately and last a lifetime. Smoking not only causes cancer, it also makes your diabetes worse. If checked regularly further damage may be prevented to your feet and your eyes. You should have both reviewed by the health service every year. If in doubt contact your local healthcare professional to arrange a review. In autumn get a yearly vaccination. Being vaccinated last year won’t protect you this year. Getting a flu vaccination doesn’t give you the flu but can protect you from it. Walking a few more steps (10%) each day could make a difference, reducing your blood glucose (sugar). If you test, make sure you understand how to use the result; if not then you are pricking yourself with little benefit. If you are prescribed medication, take it, if not you are risking your health. If you are worried about taking your medication speak to your doctor or nurse. Eat less salt, exercise regularly and eat more fruit and vegetables. Eat fresh food (not pre-packaged) where possible. Eat five fruit or vegetable portions per day. Count your calories to understand how much you actually eat and if this is right for you. Eat less fat, exercise a little more and take your medication. If you smoke, ask for help to stop. Maximum – 14 units per week, for Men and Women (see bottles for units per drink). Do not forget to count the calories from your alcohol into your daily intake.